Ratifying and implementing this Convention is about remedying existing injustices and preventing further violations of women’s human rights. The World Future Council, Inter-Parliamentary Union and UN Women awarded the Istanbul Convention their newly created Vision Award. Presented as part of the World Future Policy Award 2014, this award honours the ground-breaking nature of the Istanbul Convention and the vision it carries for women in Europe and beyond to lead a life free of violence. This is the second award presented to the Istanbul Convention, which demonstrates recognition of the fact that it is currently the most comprehensive international instrument on violence against women. 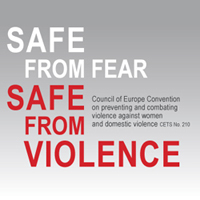 The Council of Europe Convention on Preventing and Combating Violence against Women and Domestic Violence – which is more widely known as the Istanbul Convention – is relatively new: adopted in 2011 and entered into force only recently, on 1 August 2014, and is open to any State in the world. It is currently the most comprehensive international legally binding instrument on violence against women and domestic violence. This is a key aspect of this convention’s visionary nature. It is multi-disciplinary, with long-term preventive actions as well as measures to ensure the prosecution of perpetrators and protection of survivors. For to be effective both the prevention and response to violence against women must take a comprehensive approach. An approach which includes: collecting reliable data to inform laws, policies and programmes; implementing laws and policies that respond to and prevent violence; addressing impunity and ensuring women’s access to justice; and developing quality essential services for the protection, ongoing safety and recovery of survivors. The Istanbul Convention addresses these essential aspects: it explicitly defines violence against women as a human rights violation; it recognises unequal power relations between men and women as the root cause of violence against women and it advocates a gender-sensitive perspective in tackling it. The Convention also places the survivors’ rights and needs at the core of all State responses, while stressing the needs of particular groups of survivors. It emphasises prevention measures and it requires State parties to establish specialised institutions; to form partnerships with the non-governmental sector and the media; to ensure budget allocations; and to undertake regular data collection and research. Crucially, the Convention also provides for a monitoring mechanism through which State parties can and are to regularly assess implementation. It is essential that this mechanism is strong enough to monitor and to hold States accountable. We know from experience that “vision” is not enough on its own. This Convention must also have teeth and be prepared to bite. To date, 14 member states of the Council of Europe have ratified this new human rights treaty and another 22 states have signed it. The UK has signed but not yet ratified it. According to a new EU Fundamental Rights Agency (FRA) report, one in three women (33 per cent or 62 million women) across the 28 EU Member States has suffered physical and/or sexual violence since the age of 15. These women are raped, mutilated, harassed, beaten or killed. Fifty-six per cent of Belgians, for example, know at least one person who has suffered serious sexual violence – a human rights violation that goes largely unreported due to prejudice and social stigma. An estimated 500,000 women and girls in the EU alone have suffered from female genital mutilation (FGM), another form of violence suffered by women and girls, while an additional 180,000 are at risk each year. The largest numbers of women and girls originating from countries where FGM is practiced live in the UK, Italy, France, Germany, Ireland, Netherlands, Sweden and Belgium. The illegal practice impacts on women’s health, well-being and ability to achieve their full potential. “Protection requires governments to keep women and girls safe from violence. “When preventive measures have failed and violent incidents have happened or are about to happen, it is important to provide victims and witnesses with protection and support so they can rebuild their lives,” said Michael Bochenek, Amnesty International’s Director of Law and Policy. Develop a gender-sensitive asylum system – the obligation to protect includes the right to international protection. Women and girls who suffer from gender-based violence in third countries can seek protection in another state when their own fails to prevent persecution or to offer adequate protection and effective remedies. “Ratifying and implementing the Istanbul Convention is not a question of granting special rights to women, it is about remedying existing injustices and preventing further violations of women’s human rights,” Bochenek said. Amnesty International (AI) was instrumental in the process of drafting the Convention, by providing information based on the experience of NGOs in working with survivors of gender-based violence, as well as best practices, existing obligations under international human rights law and standards. This treaty is therefore a reflection of core international standards and the views of civil society.